Everyone who has been a parent will know that young children are often unpredictable. They haven't yet learnt all the rules of civilised behaviour or self-control, and sometimes get out of hand. Well, young stars are the same. They just can't stay at one brightness all the time! Why are so many young Stars variable then? Depending on how much material the star contains, we will observe it as either a fairly low mass, relatively cool T Tauri star (masses from about 0.5 that of the Sun to about 2.5 Solar, which will evolve into broadly Sun-like stars) or, if it is more massive, we will get Herbig-Bell stars. These will develop to be much hotter, more powerful stars than the Sun; stars like Rigel or Deneb. So we have a cloud of material that concentrates around a central core, which becomes more central and more "core-ish" as time passes, continually expanding, increasing pressure in its centre. The motion of the cloud causes the material to rotate, forming a ring around the embryonic star. 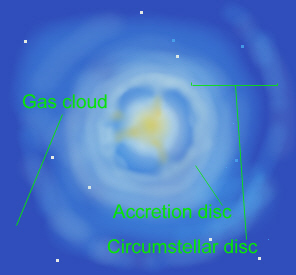 This accretion disc supplies the material which increases the star's mass and thus gravitational attraction, as described above. The increased gravity also pulls in material from farther out in the circumstellar disc, which can cause huge explosions in the accretion disc. We observe these surges in brightness on Earth as the FU Orionis stars, when a formerly faint T Tauri star can seem to "go nova" even though there is no real nova outburst. FU Orionis itself increased by six magnitudes in the course of a year, from 16th to 10th magnitude, which is where it is now. As the star accretes this new material from the inner disc, the eruption will subside, though almost certainly the process will be repeated several times. It's just that it takes a while - about 10,000 years rather than a few seconds as in the animation - for the material to build up to sufficient quantities for an outburst, so that we are only able to observe one outburst per star during our lifetimes. Another reason why the FU Ori stars are linked to the T Tau type is that they possess a relatively high amount of Lithium. This element is destroyed as the star begins to shine "as a star" and move on to the evolutionary process called the "Main Sequence" where stars burn hydrogen, so Lithium is a signature of a Pre-Main-Sequence (PMS) object, or at least a very young star. FU Ori and T Tau objects also show an Infra-Red excess, demonstrating that heat is being emitted, though not at a high enough level to cause optical effects. Compare this with a central heating system. The radiators can get quite hot, even though they never get hot enough to glow! This heat comes from the circumstellar regions where the gas and dust is being heated, both by interaction with the increasingly-hot forming star, and by processes in the ring itself, maybe partly as a result of planets starting to accrete, collisions between these planetesimals, and so on, even though that stage probably happens somewhat later. The lightcurve here shows the abrupt rise of V1057 Cygni, a FUOR in the famous North America Nebula, NGC 7000. It is currently (July 2005) around magnitude 13.